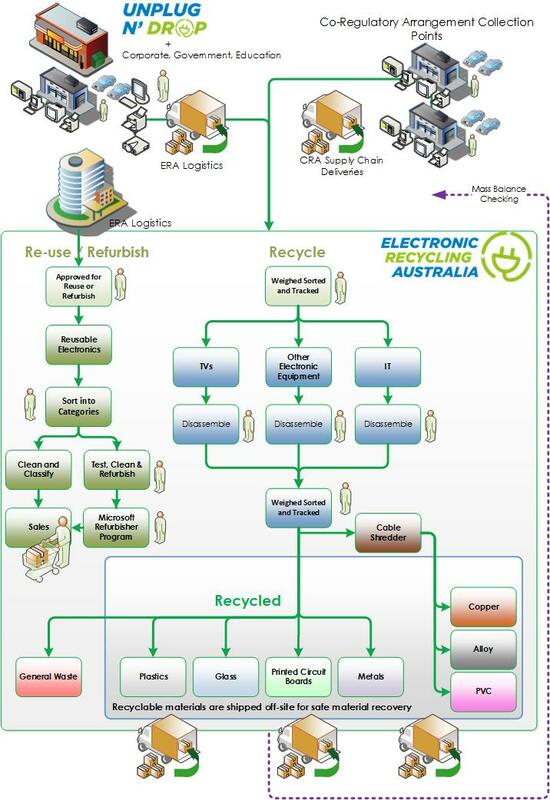 Electronic Recycling Australia offers a two-tiered approach to reusing & recycling. Our recycling facilities have the capacity to process electrical and electronic goods from both the general public and commercial businesses. The first step is to identify any goods that can be reused. After all, why recycle something that still works and may have value to someone else? Any recovered IT and television goods are tested, and if still working can be sold through our online retail shop at very affordable prices. We are also a participant in the Microsoft refurbish program, so we offer low-cost computers and laptops with genuine Microsoft software. Goods that no longer work are sorted and materials dismantled. We aim to recover as much as 95% of usable materials, diverting materials from landfill. Materials are sorted into categories – metal, glass, printed circuit boards, plastic and potentially hazardous materials – and shipped to environmentally responsible final processors. We have a sophisticated shredding system, separating ferrous metals, non-ferrous metals and non-metals. Precious materials are recovered from items including printed circuit boards, cables, metals and plastics.